TORRANCE, Calif., April 11, 2017 /PRNewswire/ — After twenty rounds of intense competition, Oakwood University was crowned the 28th annual Honda Campus All-Star Challenge (HCASC) National Championship Tournament (NCT) champion on Monday, April 10, taking home the championship trophy and earning a grant of $75,000 for their HBCU. The four-student team demonstrated its academic prowess by quickly and accurately answering questions about history, science, literature, religion, the arts and popular culture. Oakwood University was one of 48 Historically Black College and University (HBCU) teams that qualified for the NCT by competing in a series of regional competitions on campus throughout the academic year. A packed studio audience filled with HBCU students, school presidents, alumni, volunteers, fans and Honda associates watched as Oakwood University clinched the title over runner-up Bowie State University. 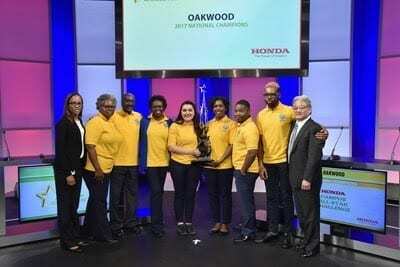 This is the third time Oakwood University has won the Honda Campus All-Star Challenge. Coached by Dr. Rennae Elliott, the winning team included Caleb Briggs, Olivia Campbell, Joshua Nwaoha and team captain, Sesly Huerfano. Runner-up Bowie State University earned a $30,000 grant, while the third and fourth place finishers – Florida A&M University and Tuskegee University – earned $20,000 each. In addition to honoring the top four teams, Honda recognized outstanding individuals who have made an impact during this year’s Honda Campus All-Star Challenge. Robert Batten, 11-year HCASC coach and Dean of Bowie State University, was named Coach of the Year. Danian Medearis of North Carolina Central University was selected by fellow HCASC players to receive this year’s Ernest C. Jones Sportsperson Award. Named for one of HCASC’s early volunteers who mentored students in the program, the award recognizes a student who epitomizes team spirit, camaraderie, good sportsmanship and academic focus. Honda established the Honda Campus All-Star Challenge in 1989 as a way to highlight and recognize the academic talents of HBCU students. More than $8.5 million in grants from Honda have provided support for books and tuition, scholarships, enhancement of student programs and other investments to improve campus facilities. This year’s journey to the championship began in the fall, with 89 HBCUs competing for a spot in the finals. Nearly 100 volunteers, including Honda associates, helped produce the 2017 National Championship Tournament, hosting the students, conducting registration and serving as game officials. 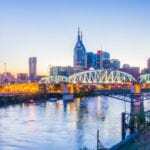 For photos, videos and more information about the 2017 HCASC competition, including a full list of the 48 teams that qualified, visit HCASC.com. Connect with HCASC on Facebook, Twitter and Instagram and follow the conversation using #HCASC.